India will remain a major tourism source market for the Gulf states as the country's burgeoning high-spending middle class looks to travel abroad for leisure and business, says a new report. Encouraged by its pace-setting 7 per cent GDP growth, India is now one of the fastest growing outbound travel market in the world, second only to China, said the Colliers International report on Mena hotels. Total Indian outbound tourism departures (worldwide) in 2018 will be 22.5 million and this is expected to reach 50 million by 2022. About 5.4 million Indian tourists will visit GCC states in 2018 and this is expected to grow to 9 million tourists in 2022, said the report. 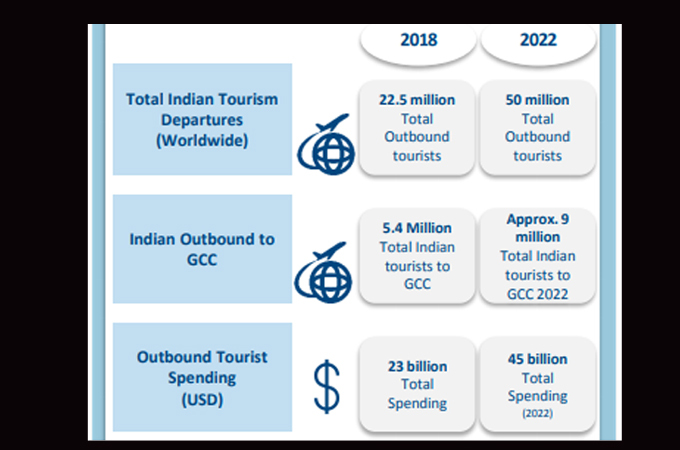 "37 per cent of India’s outbound market travels to the GCC. The popularity of this region as a destination for business, place of work and leisure underpins this demand," said the report. "Tourist arrivals from India into the GCC have witnessed constant progression year on year. The United Nations World Tourism Organization (UNWTO) estimates that India will account for over 50 million outbound tourists by 2022, making India a $45 billion outbound spend market," said the report. Despite the slowdown due to Indian rupee fluctuations, the Indian outbound market has been growing at an average annual growth rate of 10-12 per cent over the last seven years. To put things into perspective, India has been the largest source market for Dubai over the last three years. Overall in 2017, UAE welcomed 2.3 million Indian tourists, accounting for 13 per cent of its annual visitors. This is 15 per cent greater than that of UAE’s second largest source market, Saudi Arabia, the report said. Colliers estimates that an extra 10.8 million room-nights will be created by increased demand from Indian tourists to the GCC in the next five years. * Outbound tourist spending of $ 23 billion in 2018, which is expected to hit $45 billion in 2022. Across the GCC region, there has been increased efforts to grow visitor numbers. Oman has experienced a significant growth in Indian visitors during 2013- 2018. The CAGR growth in Indian tourist arrivals has been 8.3 per cent. The UAE has also experienced a significant increase in growth of Indian visitors from 2015 – 2018. India is UAE’s largest source market. Saudi Arabia has been witnessing a steady flow of Indian tourists over the last decade. Recent changes in Umrah visa rules allowing Umrah travellers to visit any other city in the kingdom, along with other initiatives are expected to boost tourism. Bahrain has witnessed a stable growth in the number of Indian visitors between 2013 – 2018. The average growth has been persistent at 5.4 per cent CAGR. However, Kuwait has experienced a negative growth rate of -8.5 per cent in Indian arrivals over the last four years, the report said. There are 1,065 weekly India-UAE flights corresponding to 130,000 seats per week and bilateral talks to increase airline frequency with various countries across the region are underway. What hoteliers can do to attract Indian travellers?